Another installment in the sports game series dedicated to Australian football. The title, developed by Wicked Witch Software, is a hybrid of sports and management simulations – while playing, we not only play matches but also take care of the team manager’s responsibilities. Our tasks include determining team composition and tactics, taking part in drafts and making transfers as well as negotiating contracts and balancing the club’s budget. There are over 80 licensed teams at our disposal. New solutions introduced by the developers increased the game’s realism, too. 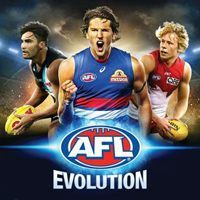 At the core of AFL Evolution lies a career mode that lets us lead our own player up the professional ladder. Apart from that, we can play a full season with any team and face the artificial intelligence in single matches. What’s interesting, the multiplayer mode offers both a competitive and cooperative (two players in a single team) mode. The production features its high-quality graphics and a well-made replay system. AFL Live: Premiership Edition is the third part of a series of sports games dedicated to Australian football. Following the earlier releases of the cycle, production uses the official AFL (Australian Football League) license, which allowed IR Gurus Interactive developers to use the teams of authentic teams participating in the 2004 season. AFL Premiership 2005 is a sports game, which is an unofficial continuation of the American football simulation cycle AFL Live. The player directs the actions of his favourite teams of the Australian Football League (AFL) from the 2005 season. The title was produced by the IR Gurus Interactive studio. AFL Live 2003 is a sports game simulating Australian football games. The title was produced by IR Gurus Interactive studio under license of Australian Football League. The player has the opportunity to lead the players of authentic teams participating in the 2002 season. AFL Live 2004 is the second installment of the series of sports games, which are simulations of Australian football games. The production of the IR Gurus Interactive studio is licensed by the Australian Football League, allowing developers to enter authentic player names and team names from the 2003 season.